I think one of the best gifts you can give your 18 or 21 year old is a plane ticket. One way if they’re a turd. I am super fortunate that I have traveled my whole life. Being born in the Channel Islands to intrepid parents ensured that my childhood had a bit of adventure and I got a few stamps on the old passport. I think that taste of travel as a child was one of the biggest catalysts to me wanting to travel so much. The tastes and smells of adventure… so many memories of cultures so different to ours. So many people who live in ways so unimaginable unless you’re sitting on the dirt floor of their hut, playing charades with someone who doesn’t speak your language in order to communicate, getting ripped off, swindled, charmed or wooed, or drinking beer under a palm tree with a kid who has grown up in a parallel universe. All I know is the more I travel, the more I want to travel. I’d love to trek with the kids on our backs (maybe we’d get sherpas for that), andI don’t know if I’m still up for camping at the end of the day. Babies and mortgages have temporarily shackled us at this present moment, but Mister H is a bit of a traveler too. It won’t be long before we can go exploring again and instil a love of travel, and exploration and different cultures in our children. I’ve never been to Japan, and I’ve never really been attracted to it, but I know one thing I would love about it is the food. 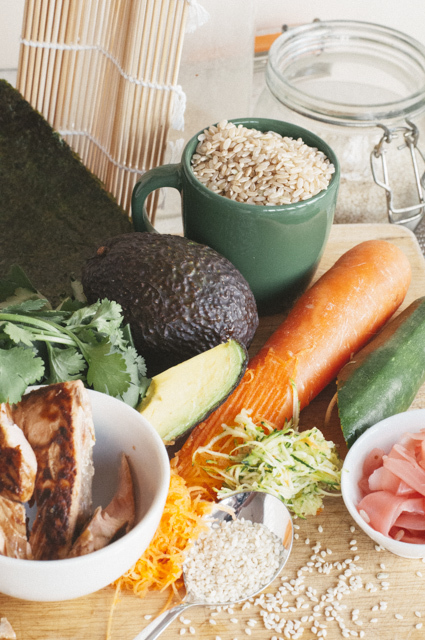 I love brown rice sushi and when I recently saw Brenda from Brenda Janschek Health and Nutrition make her sushi rice loaded with goodies, she totally inspired me to push my growing edge and get my sushi on…. Our only regular fast food is sushi, and now that I’ve mastered it, I think it’s fast food at home all the way. Pop your rice with 3 cups boiling water in a saucepan on the stove, turn it down low, stick a lid on and leave it until the water is absorbed and your rice is cooked (30-40 mins). When cooked, remove from pan and place it into a flat dish, pouring over your sushi vinegar seasoning. Stir well to combine and leave to cool. Roll your salmon in the ketcup manis and cook in a little coconut or peanut oil in a frypan (or BBQ is even better) until just cooked. Remove from heat. 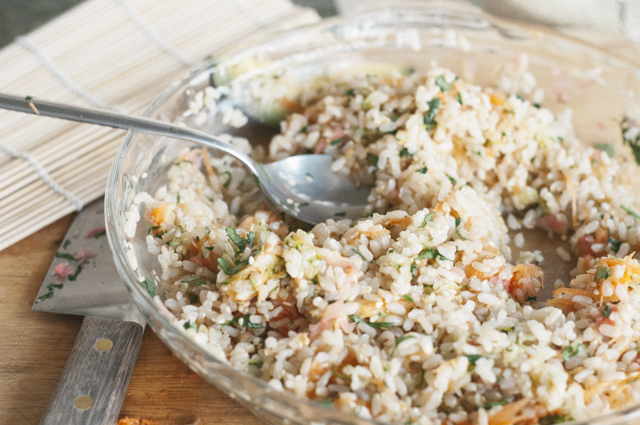 Toss your carrot, zucchini, coriander, chopped ginger and toasted sesames through the seasoned rice and stir well. Place your nori on your sushi mat and spread a generous layer of your sticky rice over the nori, leaving a bit at the edge bare. Flake off your salmon and lay a nice chunky line through the centre, along with some sliced avocado and a little smear of mayo. 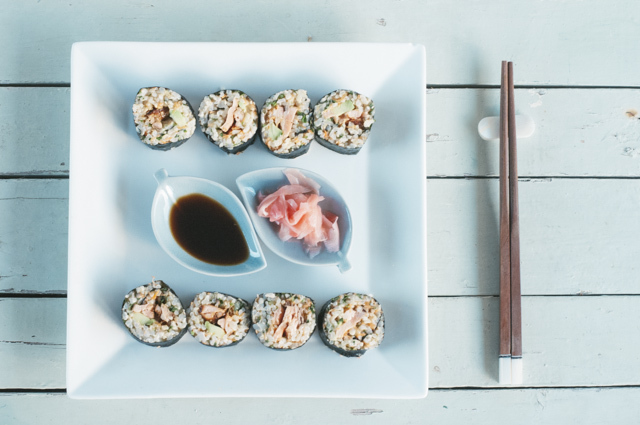 Using your bamboo mat, roll your sushi quite firmly to ensure it sticks nicely together. Roll until it is a tight cigar and set aside. Repeat until all ingredients are used. I sometimes have rice leftover which is fab in a salad. 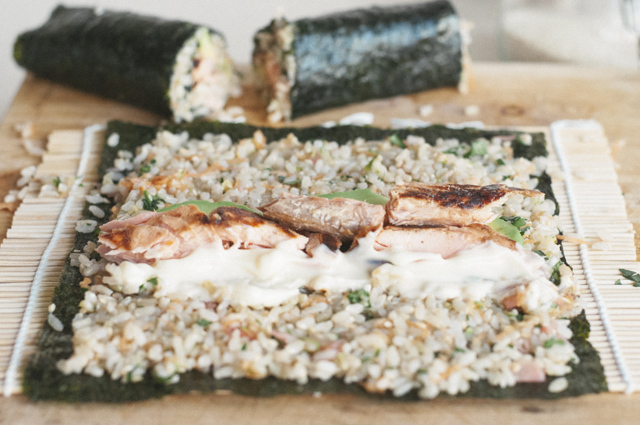 Using a sharp, wet knife, slice your sushi in half, then in half again, and then in half again…. unless you prefer a large roll. Hooking up with Our Growing Edge over at Sweets and Brains. Thanks for hosting, guys! Reading your description of your travels makes me tear up a bit! I have only been to 4 countries and none of them were terribly exciting. I am itching to see the world and can’t wait until our kids are older so we can take them with us!! Gorgeous looking sushi! I wish I liked it, but the fishy taste of the nori gets me every time. I think it’s quite an acquired taste. My first few times I was unsure!! I’m lucky my kids love it so I can feed them cheaply and quickly when we’re out and about. Going to see just how long I can go without them noticing McDonald’s!! Looks tasty! Did you use smoked salmon? I have tried making maki before, but didn’t love the end result. I enjoyed traveling in Japan and eating! I wrote a few blog posts about the 3 months I was there if you want to check it out. No, I cooked up a fillet. I’m Not a fan of smoked salmon in sushi to be honest. Usually I’ll just eat it raw at a Japanese place but this sweet sticky salmon is delish! I’ll pop over and check out your adventures. 3 months is a wonderful length of time to really immerse yourself in a place. Yes, I will eat it raw in a restaurant, but haven’t been brave enough to use raw fish at home. I was in college when I was in Japan. It was an amazing opportunity. ..I agree traveling is wonderful! We have stayed closer to home since having kids as well. How much does a mortgage cramp your style???? That’s great that your parents and upbringing gave you such a love of travel. My dad was a frustrated wanderer but held back by my mother who a dedicated homebody. I got the travel genes from my dad though and can already tell that my youngest child is going to be a traveller too. We have to content ourselves mostly with adventures in our local area at the moment but have big plans to travel much more in future and to encourage the kids to do the same. I’m so impressed you’re making sushi Danielle! There’s a local sushi joint that specializes in brown rice sushi and I love it. Unlike you, I didn’t/don’t get to travel much. I did however live in another country for the first 8 years so I totally know what you mean about witnessing abominable conditions that first world countries don’t have to deal with, and it’s truly eye opening. I hope once our expenses (ie childcare and preschool) have died down, and the kids are older to appreciate all this, that we can travel as a family for the very reasons you mentioned. 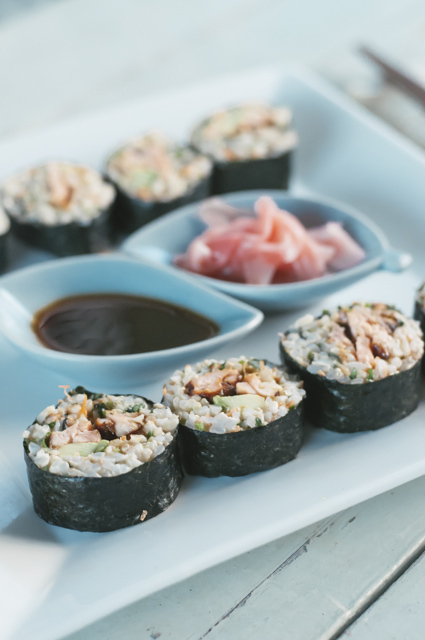 It’s easier than you think to make sushi! Give it a shot. I can’t wait to do some meaty traveling with my kids. Where were you born? I don’t think I know that?